Donation Methods – Neighborhood Health Clinic, Inc. If you donate stocks, bonds or equities, you may be able to avoid tax on the appreciate value while receiving a tax deduction. Please consult your financial, legal or tax advisor about the specifics of your donation. Designate the Neighborhood Health Clinic as a beneficiary in your will, trust, IRA, retirement or insurance plan. Establish a trust which benefits the Neighborhood Health Clinic. This may provide income for you and your spouse as well as a substantial tax savings. Please consult your financial, legal or tax advisor about the specifics of your donation. Send a donation in memory of a special friend, occasion, or anniversary. We will send an acknowledgement of the gift to the person of your choice. Does your employer match charitable donations? If so, ask your employer to match your donation to the Neighborhood Health Clinic. This fund was established to sustain the Clinic’s vision with a solid financial base and to ensure that the Clinic’s needs of today and the opportunities of tomorrow are met. 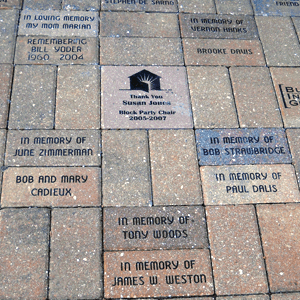 The walkway in the front of the Clinic is lined with bricks and you have the opportunity to place your name, names of your loved ones, or your business on one. It demonstrates your continued support to the Neighborhood Health Clinic.